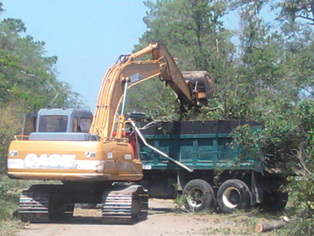 ﻿The Town of Cape Carteret will continue to have leaf and limb pick-ups in 2018-2019, four times this fiscal year. Please view the schedule below. Please do NOT bag leaves. Leaves and limbs must be in separate piles or they will not be picked up. Limbs cannot be larger than six feet long or six inches in diameter. No trees will be picked up. If you lease or rent your property, it is your responsibility to notify your tenants of this schedule. Anyone putting leaves or limbs out other than on the scheduled dates shall be charged a minimum fee of $50.00. The property owner is responsible for this fee regardless of who occupies the premises. Schedule: Debris will be picked up on your street once. If you put it out after it has been picked up, a notice for you to remove it will be sent. PLEASE put the debris out the weekend before the pickup. times through the course of development, these features get altered unknowingly. and help us keep them free of vegetative overgrowth and trash.